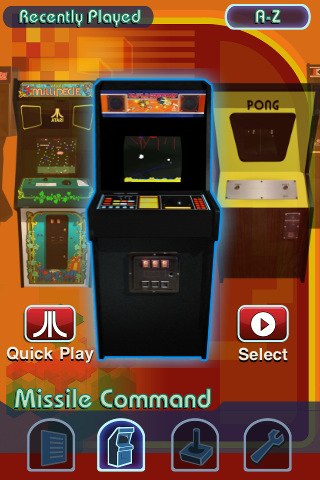 If you love retro gaming as much as I do, Atari's latest app for the iPhone and iPad (which will launch in the US App Store later today) might as well be a dream come true: with Atari's Greatest Hits, you'll have access to 100 old Atari games from a single app that presents them in a beautiful interface with arcade cabinets and original box arts. That's right, 100 games in a single universal app. Where's the catch? The app is free and comes bundled with PONG, but if you want to download the other included games you'll have to choose between some in-app purchases options. The huge deal is the following: games have been organized in 25 game packs; each game pack will cost you $0.99 via in-app purchase. Alternatively, you can buy all the packs (and thus 100 games) together with a single purchase at $14.99. Which brings us to: 15 bucks for 100 old Atari games, on the iPhone. Some of them have even been updated to include local Bluetooth multiplayer. I won't be missing this offer as soon as the app goes live, for sure.